Well it has been a while since our last report, not like us but this can only reflect one thing, we are smoking busy both on the river with great clients and also in the office trying to keep up with sales and bookings. All of the above is true and we are very sorry for the lapse in keeping you all up to date with all what is going on with regards to the great fishing. 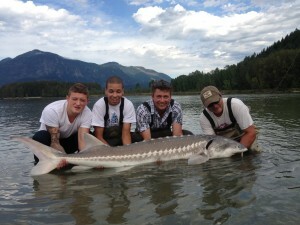 Now we rounded up the Upper Pitt River Adventures for August with some days that would shatter most people. The river had really changed so much for the better this season, fish were throughout the entire system and not just packed up in a few runs. 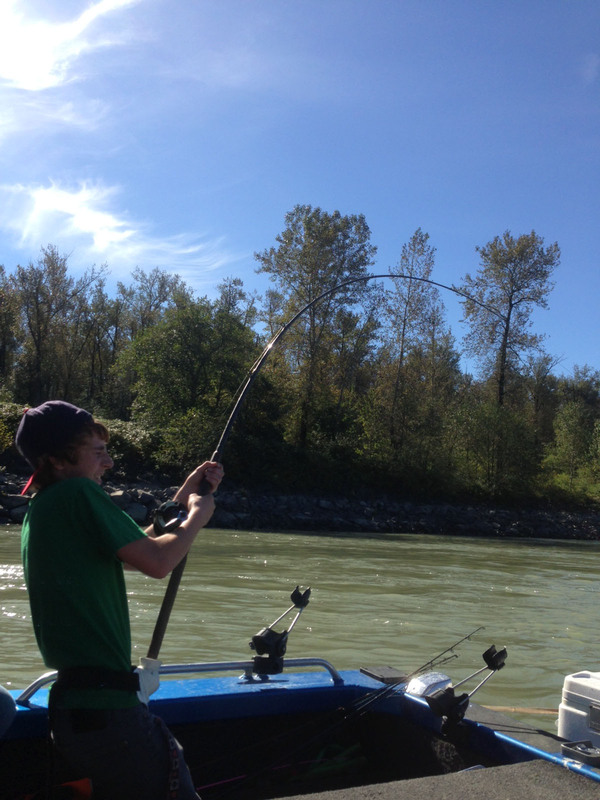 The Sockeye did not let us down and we had many days with multiple double and triple hook ups at a time. There was also some non-target incidental caches of King (Chinook Salmon) although this is a very controversial topic when we are fishing with switch rods and double handed rods then this is bound to happen from time to time. We keep all these fish in the water and use catch and release nets. This is the same respect we give to all fish. The next great fishery to happen is the October Coho (Silver) experience and although this is not a science with respect to timing, we are booking dates from October 15th to November 5th – we have found over the years this is the best 3 weeks to target these fish. This is best with the single handed rods and our team guides still have a few days open for this wilderness fly fishing experience in a area that is so rarely fished. Booking with our guides ensures early access to the river and a jet boat to get you to the many different runs that hold fish. There are other companies that use rafts for this fishery, but truly being there 1st and having a roof over your head to warm up and to store your gear goes an awful long ways to helping you to make your day the best it can be. Another great venue that we have not offered for the past 3 years will be offered again in 2014 April – we are putting in our land based wilderness fly fishing camp in the Lillooet River and opening this up to only a number of clients wanting to book the timeframe. Their will be only 2 guides and boats on the river in our camp so that means 6 anglers total – 3 per professional guide. The camp will be for 3 or 6 days with a 1 day changeover for us to keep up with the cleaning and food supply. If you are interested in this camp, then email us at info@greatriverfishing.com to get on the list . Pricing will be sent out in late October early November and this is will be booked on a 1st come basis. Visit our Lillooet adventure on our website at: for more info and pictures. Now on to the Fraser River and all the great fishing taking place. 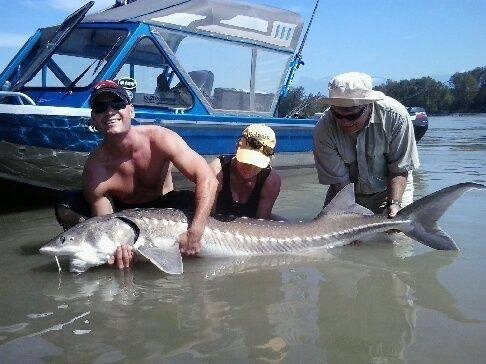 I have to say we have never caught more Sturgeon (and big Sturgeon) in the history of the company as we have in the 2013 season. Our GRFA Crew team guides have really dialed in the bait and locations and we are making “Raving Fans”. 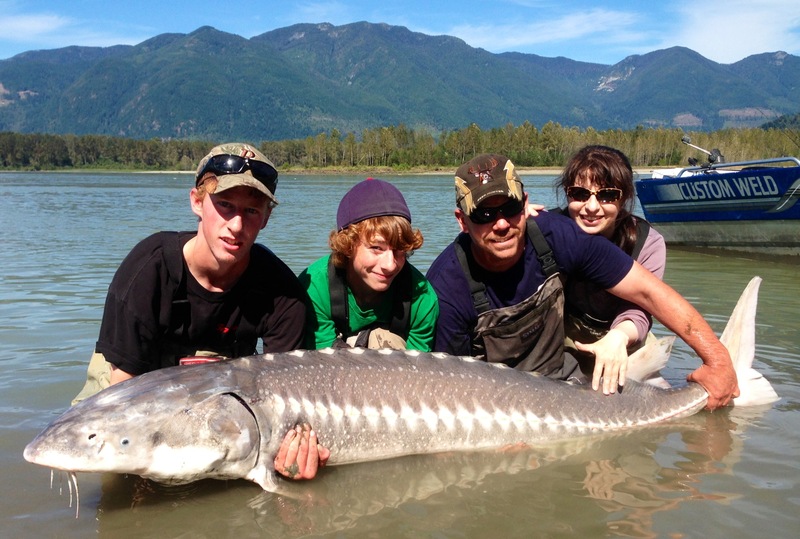 We have seen some very interesting information from our efforts in the Sturgeon – mark recapture program. 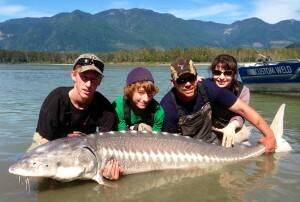 We are catching so many big fish that we have not seen since in the year 2000 and 2001 it is mind blowing. This can only mean one thing, these fish are ocean migrating Sturgeon and coming in chasing the huge Pink Salmon run up the river. We can almost see their migration route and calculate where they will be the next day and so on. Thus this keeps you our clients into some of the best action. So it will be so interesting to see how the next month plays out and how many of these thought to be ocean migratory fish get caught and are recorded. This is a month that we see huge catches and usually some monster fish – not that we have not seen some monsters every month but these fish are very aggressive and jump so many times when hooked up. We have only a few dates left available before being fully sold out for September so give us a call to get in on the action. We are proud to be continuing our work with Ducks Unlimited and we are joining our efforts for the 2nd Annual Ducks Unlimited Sturgeon Classic – we are sold out on the registration and with the help from key guys like Henry Kozler and Eric Dyck – both longtime DU organizers and supporters we have this Sturgeon Classic ready to go on Saturday September 14th . If anyone wants to come out to the DU dinner at the Best Western Hotel please email mclive@greatriverfishing at mclive@greatriverfishing.com last year this event raised some very good money for DU and we are looking forward to having this special Tournament continue for many more years to come. Potentially there could be over 200 fish caught on this day. Another great way that GRFA Crew is working together with local and National organizations to bring awareness and to help bring like mined people together to raise funds for what we believe in. Conserving together for the future comes to mind. Salmon fishing is coming on in the Fraser River and with the recent re-opening this has made our jobs much easier as a guide team. We are sure that there should be a full opening for all species in the next week. As of right now we are allowed to target Pink, Chum and Coho Salmon and that is a great start for all our clients. Pinks are in the mainstem Fraser River and tributaries in great numbers and can be targeted best with spinners, jigs, fly’s and spoons. This has to be one of the best fisheries to start off youth, and all inexperienced anglers, this is a catching fishery and we all know that catching is key to getting people energized in fishing for the future. Chums are starting as are the Coho salmon and soon there will be so many Salmon in the river we will be challenged to keep them off the lines. One great method that is never forgotten to me and many of our GRFA Crew team is bar fishing and this can be so much fun – it is family fishing at its best and allows people and groups of people to socialize while fishing on the river. 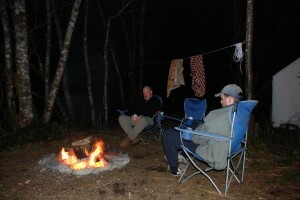 Some of my fondest memories are when we all went bar fishing and camping. The upcoming montsh with all the fly fishing, both single and double handed Spey will show why the Fraser River and it’s tributaries have some of the best fishing in the entire World. 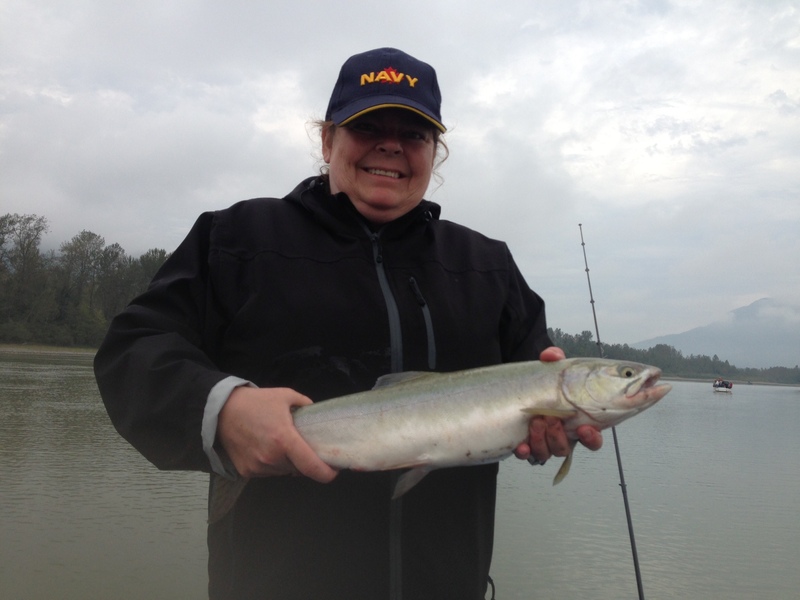 Chilliwack is certainly a World Sportfishing destination and we are glad to be the leading provider of 1st Class Adventure experiences. Let our team show you how fishing can be so fulfilling. I would also like to keep mentioning that we really need to make a big effort to keep our rivershed area’s clean. Taking the time to remove a little garbage each time you go to the river will make a difference. This difference shows the people visiting from around the world how much we care for our Country. I was recently in England and could not believe the cleanliness of all area’s. Be a proud Canadian and let’s get with the program, if the UK can do this with so little space and 65 million people we can do this too! Tale out more than you carry in! Also be sure to call and report all violators and write down and take pictures, make people accountable for their actions. Finally a mention for the Fraser Valley Salmon Society – I encourage our clients and friends to sign up for small amount of $10.00 to support your local organization that has your best interest in mind. The membership and Directors have a mandate to *Conservation *Opportunity * Family principles for keeping you on the water and for the years to come. Think not only of yourself but the next generations and protect our rights to fish forever. Well that’s a rap, another long one as usual but there is so much to talk about when it comes to fishing this incredible area in beautiful British Columbia.